In case of rain, some sessions of the tour may have to be cancelled. Language is not a barrier for this tour. Before the grand master comes on stage, extras show up to build a compelling and powerful opening scene. But this time, the leading role never appears, leaving the centre stage empty. Only some extras are seen continuously rolling, kicking, jumping, leaping and dancing … they perform diligently and never miss a show. They seem to be a motley crew, mixing elements of Parkour, Tricking, Capoeira, Acrobatics, Lion Dance and Taekwondo. Together with contemporary dance frameworks and concepts, they stage a surprise attack in the corner of this city every now and then. The music composition is equally challenging, juggling between classical music through our mobile apps to your earphones and an on-site mix of percussion, strings, winds and electronic sounds. The live elements are a mix of different styles and traditions, experimental and in free form. Audience can select between the two distinctive listening experiences on their own will. Registered participants will have the best experience of interacting. 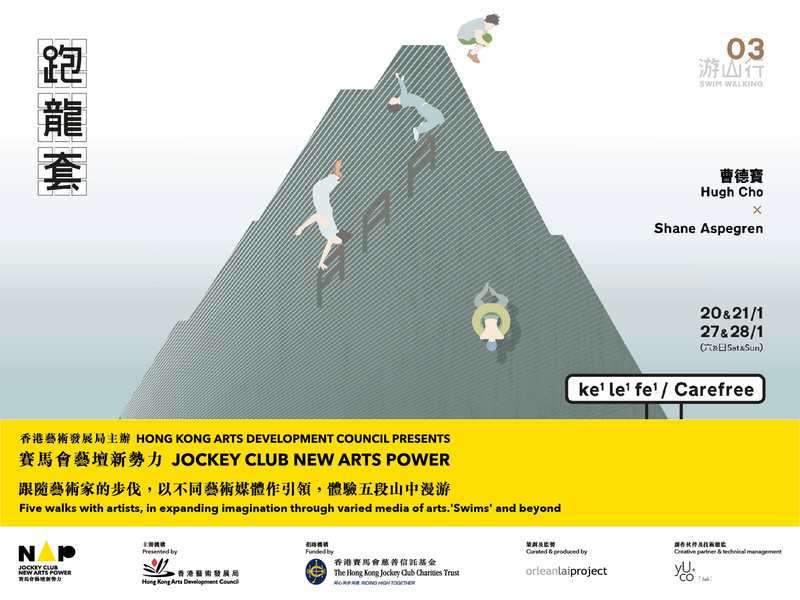 Interested parties can register in advance at http://newartspower.hk/programme/swimwalking. Please read through the Notes on Registration, Notes on Participation and Adverse Weather Arrangements before registering. This programme is suitable for aged 12 or above only. Each person can register for a maximum of two places for each programme. Confirmation will be sent to you automatically by e-mail. Please make sure the e-mail address you provide is valid and check the junk mailbox if necessary. Please contact us if you do not receive any confirmation email after registration. Please notify us by e-mail (swimwalking@newartspower.hk) if you would like to withdraw or make changes to your confirmed registration at least 1 working day before the programme date. In accordance with Section 18, 22 and Principle 6 of Schedule 1 to the Personal Data (Privacy) Ordinance, you have the right to request access to and request correction of personal data. The personal data you provide by means of this registration will be kept as records of this project only. Please bring along the confirmation e-mail for registration at the gathering place. Please arrive at least 15 minutes prior to the starting time, and present at the entry the QR code to check in. (You may print it out or show it via your mobile device.). All programmes will start on time. Reservation will be cancelled if participant fails to arrive on time. Please note that the meeting place of each route is not the same. One person per ticket, all participants have to hold valid QR code for the experience. Please note that no parking space will be provided at the venue. Please note that the programmes will be around 30 minutes to 60 minutes long, and no seats will be provided during the progamme. Successful participants will receive an Apps download link by email after registration. Please download the event App in advance. As participants will be strolling in streets during the programme, please pay attention to the traffic condition and the surrounding environment at the same time to ensure your own safety. Participants are advised to wear comfortable clothes and shoes. As no baggage storage service will be provided at the venue, please refrain from carrying any bulky items with you during the programme. The venues in which the programmes take place are not entirely barrier-free environments. We apologise for any inconvenience this may cause. Participants may be captured in photos or video-recordings during the tour. The materials may be saved and uploaded to the organiser(s)’ and the artist(s)’ websites, social media platforms, publications and/or publicity materials. All photos and videos will be used for promotion and educational purposes only. Please follow the instructions of our staff during the programme. For participants’ safety, if any emergency situations happen during the programme (e.g. adverse weathers, accidents or disturbances), the programme may be suspended or cancelled immediately depending on the actual conditions. If there are any emergencies or if you feel unwell, please seek assistance from our on-site staff immediately. Please understand that your participation is done at your own risk. To the maximum extent permitted by applicable law, you shall assume all risk or injury to yourself, and agree to release and discharge the organiser(s) from any and all claims or causes of action, known or unknown, arising out of or in connection with your participation, whether arising out of the organiser(s)’ negligence or otherwise. Hong Kong Arts Development Council reserves the right to decide and alter the operation of the programmes at its own discretion. We shall inform you of any changes or cancellations to any confirmed registration. Programmes may continue or be suspended depending on the actual conditions at the venue. If the warning / signal is issued / hoisted at 8am on the day of the programme, all programmes on that day will be cancelled. Organiser will not provide substitute slots for those people reserved at the period of adverse weather. The affected participants can make new reservation at the online platform again upon availability. 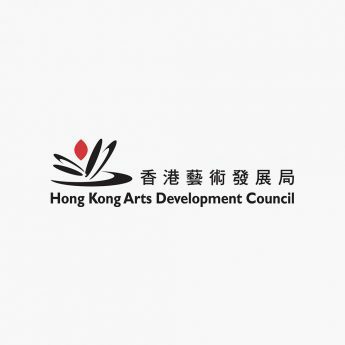 Hong Kong Arts Development Council reserves the right to cancel the programmes under other inclement weather conditions. Graduated from the Hong Kong Academy for Performing Arts. Hugh is now a freelance dancer, choreographer, and part-time acrobat. Born in 1975, USA, currently lives in Hong Kong. Working across various media, his projects often juxtapose obsessively-fixed elements with temporal or improvised aspects—many of which function within a collaborative or otherwise responsive nature. In the field of music, Aspegren has made dozens of studio albums, one-off projects & world tours, in addition to numerous soundtracks and sound design. Alongside other current projects, he is co-founder of the electro-psychedelic group Blood Wine or Honey and founder of the Hong Kong based production studio Bellows. Aspegren's work has been commissioned or presented by museums and art spaces across North America, Europe, and Asia, including Art Basel, Anthology Film Archives, MCA, Festival International du Cinéma Méditerranéen, Shanghai Gallery of Art and Palazzo Reale.